Arsenal have reportedly earmarked Paris Saint-Germain midfielder Christopher Nkunku as a potential signing during the winter transfer window. The north London side are looking into a reinforcement in the centre of the park but so far, they have found no success with a deal for Barcelona's Denis Suarez hanging in the balance. 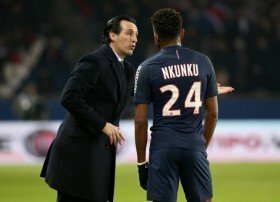 According to The Sun, Gunners boss Unai Emery has now shifted his attention to former club Paris Saint-Germain where he has identified Nkunku as a probable signing. The France youth international has already made over half a century of appearances for the Paris giants but he has struggled for regular gametime with his last league start coming in November. As such, Les Parisiens seem more than open to sanction the midfielder's sale but the Gunners are only expected to propose a loan move with the option to buy in the summer. Arsenal have been hampered by numerous injuries over the course of the season and they are currently without Danny Welbeck, Rob Holding and Hector Bellerin for the remainder of the campaign.